Pavitra Aryal, a member of the EcoTea Cooperative, plucks the first flush of organic tea in her farm in Illam in eastern Nepal. A new World Bank Group report analyzes Nepal’s participation in global markets and recommends policies for increasing trade integration and boosting the economy. Nepal is trapped in a vicious cycle of migration, low competitiveness, and high tariffs on imports that further affect the competitiveness of firms that need imported inputs. Nepal has untapped potential in many sectors – including tourism and niche agricultural exports – but low levels of FDI are hindering progress. When you pause to consider Nepal, you might conjure images of beautiful Himalayan scenery, peaceful yoga retreats, cultural and religious heritage, challenging mountain treks, or even the ultimate mountaineering feat – Mount Everest. On the surface, Nepal appears to have all the ingredients for a booming tourism sector. But digging deeper reveals an economic morass marked by political instability, deficiencies in infrastructure, stifled investment, and skills shortages. More and more Nepalese workers are seeking opportunities abroad, which further dampens the country’s economic momentum. 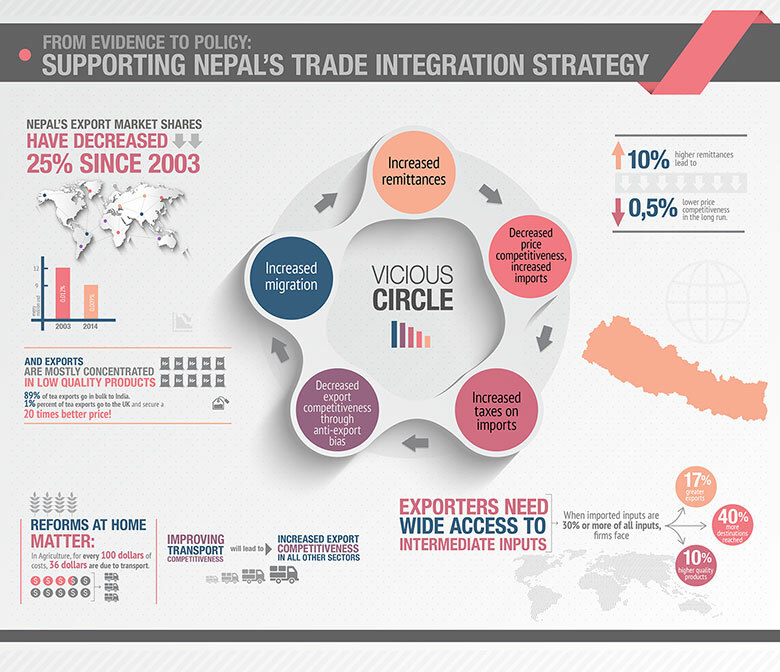 A new report from The World Bank Group, From Evidence to Policy: Supporting Nepal’s Trade Integration Strategy, looks at Nepal’s current participation in global markets and makes recommendations on how the country can increase trade integration and boost its economy. The report suggests that Nepal is in dire need of an economic transformation, which would require a shift away from remittance-fueled growth to growth driven by productivity and investment. Attracting and retaining foreign direct investment (FDI) will be a crucial component of Nepal’s future growth. At less than 1% of GDP, Nepal’s current levels of FDI are the lowest among similar countries. Restrictive FDI policies are partially the culprit. Foreign ownership of firms is restricted to 51% in some sectors, there are caps on the permitted levels of FDI in others, while in certain sectors – including poultry, fishery, and electronic media – it is prohibited to have any levels of foreign investment. In addition, employers face a lengthy process to hire foreign workers, and it remains difficult to take profits home. Nepal has prioritized several export sectors with potential – cardamom, ginger, tea, medicinal and aromatic plants, fabrics, textiles, leather, footwear, pashmina, carpets, tourism, professional services, and IT engineering. Restrictive FDI policies and policies that make it difficult for exporters to access inputs from abroad negatively impact each of these sectors in a variety of ways. For instance, Nepal is considered one of the most beautiful countries in the world, and as a result, is a desirable tourist destination. However, electricity shortages are pervasive. What’s more, its potential has been severely limited by the inadequate access to infrastructure, including airports, roads, tourist-friendly facilities, and even safe taxis. Even though half of the world’s population and the fastest growing countries in the world are within a six hour flight to Nepal, tourism remains vastly under-exploited and contributed just 3.8% to Nepal’s GDP in 2014. Low FDI is also holding back Nepal’s export potential in the agricultural sectors. Many products, including teas, herbal remedies, and spices fit into Nepal’s “brand,” but the bulk of exports of these products is of low quality, with little value added. Further, Nepal lands in the lowest quintile of countries for food safety, which has resulted in repeated import rejections, affecting the reputation of exporters across the country. Its landlocked location puts a great deal of pressure on the transportation of products to other markets, but there is little competition in the transport sector, and costs are high and quality of services inadequate. From Evidence to Policy maintains that improving the quality of exports, together with reforms conducive to more competition in the provision of basic services– which more FDI could help achieve – should be one of the core pillars of a strategy that reignites growth in Nepal.
" FDI is a proven catalyst for growth, development, more and better jobs, and even improved quality of exports. If the Government of Nepal is to achieve its ambitious objectives of reaching middle income status by 2030 and reducing absolute poverty to single digits, it will need to make some important policy adjustments. " From Evidence to Policy points to several policy adjustments that will help Nepal become more competitive in exports and create better opportunities for Nepalese people. Attract, retain, and connect FDI to the economy through reforms to the investment policy regime. This means improving infrastructure services, removing barriers to foreign investment, and streamlining business processes. Streamline tariff codes. This is critical to make business easier for exporters that need access to imported inputs to increase, diversify, and improve the quality of their products. Promote e-commerce platforms with necessary infrastructure, including a gateway for foreign payments into Nepal. This would empower exporters of high-quality products in low volumes to reach customers in developed countries. Improve the quality of exports to boost competitiveness and facilitate integration with global and regional value chains. Nepal has favorable access to developed markets for agricultural products, but the inability of exporters to comply with various standards prevent the country from taking full advantage. The report From Evidence to Policy, contains analysis on five specific areas: Nepal’s trade imbalance and remittances, integration with global value chains, establishing a dynamic services sector, export incentives, and designing institutions for promoting trade and investment in Nepal.